NEW YORK, January 19, 2019 – ​Acumotors has announced Bitcoin Diamond (BCD) and Chimpion (CHIMP) as the newest additions to its accepted cryptocurrency payment options. This integration is powered by Shopping Cart Elite’s crypto e-commerce platform. With this new capability, customers from around the world can purchase auto products from Acumotors using a wide array of cryptocurrencies, including Bitcoin Diamond (BCD), Bitcoin (BTC), Bitcoin Cash (BCH), Binance Coin (BNB), Dash (DASH), Ethereum (ETH), Litecoin (LTC) and Zcoin (XZC). 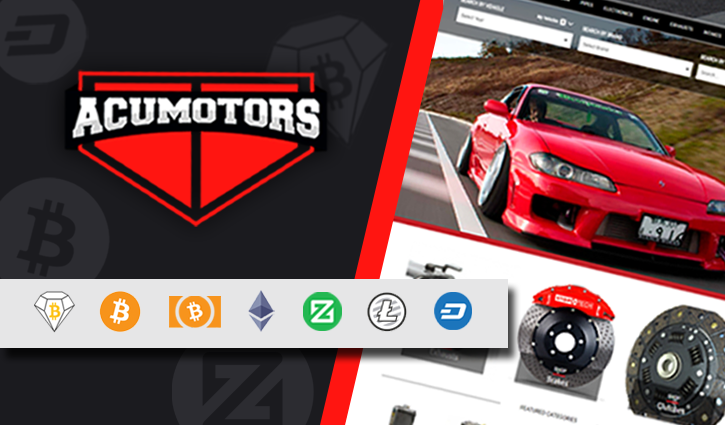 Customers can choose to directly pay for their auto parts and accessories with their preferred cryptocurrency without having to exchange for fiat currency. Acumotors is an online merchant that offers a wide range of high-quality and affordable auto parts and accessories. By accepting BCD and CHIMP, the retailer is becoming accessible to cryptocurrency-holding consumers all over the world. While e-commerce continuously reaches new highs and is evolving more rapidly than ever, security issues, payment delays, and expensive fees stemming from traditional e-commerce markets still continue to plague small businesses. Chimpion’s crypto integration allows Acumotors to accept cryptocurrency payment methods, like BCD and CHIMP, in order to overcome barriers for international expansion. With BCD and CHIMP as newly supported currencies, Acumotors provides more payment options for automotive enthusiasts. Leveraging Shopping Cart Elite and Chimpion’s technology, the company will continue to deliver unbeatable customer service by providing a seamless and convenient shopping experience. Shopping Cart Elite is an enterprise e-commerce platform that provides businesses with various automation tools to run more efficiently. The company prides itself in being a one-stop shop that does not require third-party applications in order to have marketing and SEO tools for business. Recently, Shopping Cart Elite has developed an advanced e-commerce platform designed specifically for cryptocurrency. This platform has already served as the basis for BCD Bazaar and has been adopted by several merchants, including Marks Jewelers, Mahone's Wallpaper Shop, NewParts, and more.